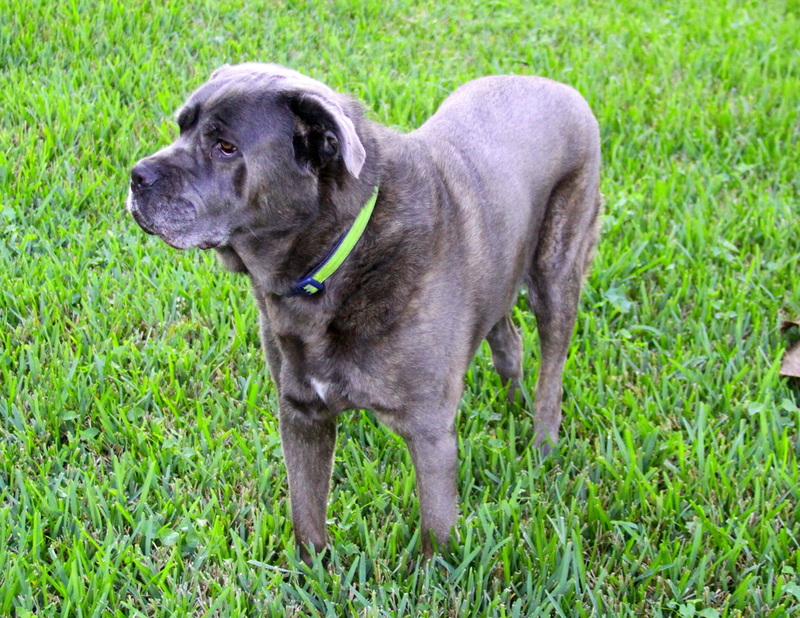 Diesel crossed over the Rainbow Bridge on 03.16.2015. Thank you to everyone who shared this webpage, his photos and videos in an effort to help Greg and me find him a forever family. Meet Diesel, an 8 or 9 year old neutered male Cane Corso, who is looking for a loving family to spend his golden years. We are fostering him until we can find him a forever home. He is an inside dog. He will do best in a home with no small children. He is dog aggressive and is reactive when any dog, regardless of gender, gets too close. He is up to date on all his shots, is heartworm negative & is on monthly prevention. He is not crate trained and will not tolerate being in a crate. He knows basic obedience commands. He does not like to have his nails clipped. He needs a night light turned on at night. 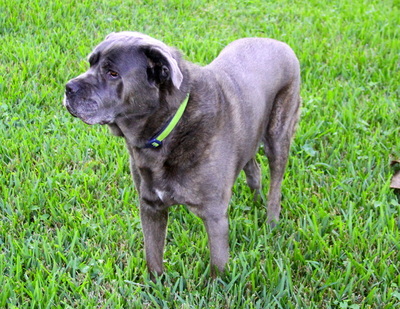 According to Diesel's owner, who had to surrender him due to a family hardship, "He really is a super sweet, affectionate, and loving dog. He just needs to be in the right home with a responsible owner and he will make an exceptional companion. He was just brought to the vets last week for a check up and he is healthy as a horse. Neutered, all up to date on immunizations, and tested negative for heart worms. He is 100 pounds and 8 years old." 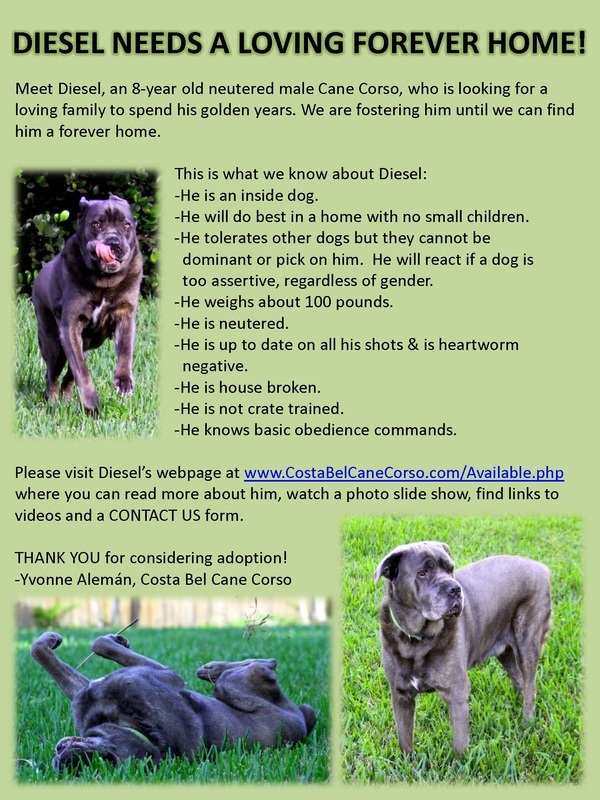 Thank you to my fellow board members of the Cane Corso Association of America (CCAA) for donating a page of The Chronicle, published quarterly by the CCAA, to help try and find a forever home for Diesel! Below is Diesel's "page" in The Chronicle. Diesel has been living with us since October 22nd, 2014. We have observed his behavior in many different situations and feel that he will do best in a home where there is someone home most of the time. He does not like to be separated from you. He has separation anxiety when he knows there is someone home, so he will not do well locked in a run or separate bedroom while you are in the house. He does not do well in a crate for the same reason. He is not destructive at all, even when going through separation anxiety. 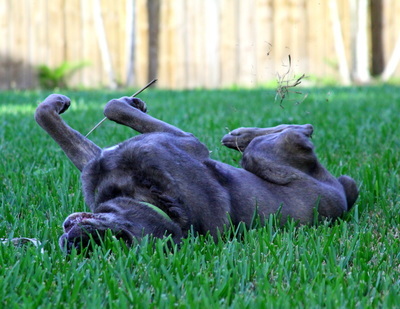 Despite his age, he is very playful and loves toys. He really just wants to be by your side at all times. If you leave the house and he is home alone, he seems to be fine. He has not had any accidents in the house and insistently will alert you when he needs to go outside for potty time. He goes out, does his business and wants to come right back in. He loves to sunbathe if you are outside with him. He walks well on a leash. 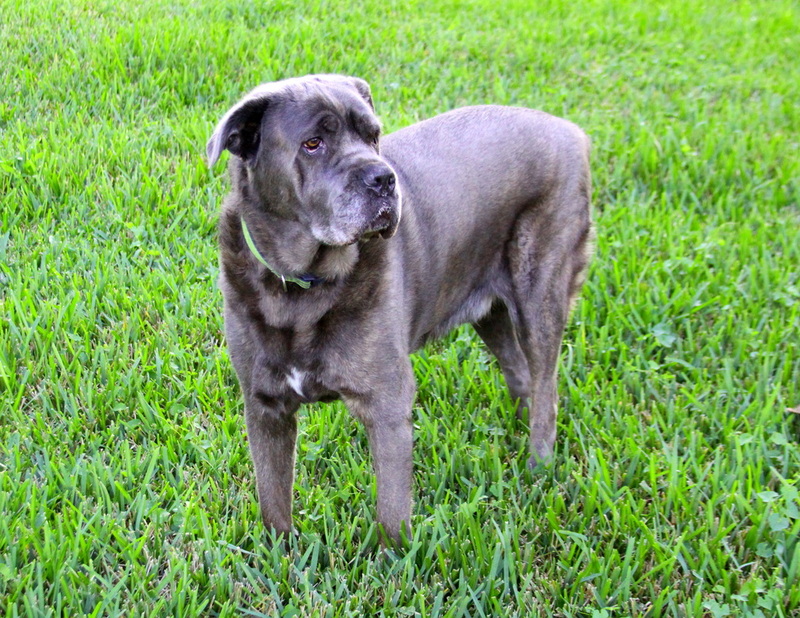 Overall, Diesel is a great dog who would make an awesome addition to the right home. If you are self-employed, retired or spend a lot of time at home, he would fit in great! Just remember that he would be happiest in a one dog household. We have not exposed him to cats, so we cannot say how he would do with cats. 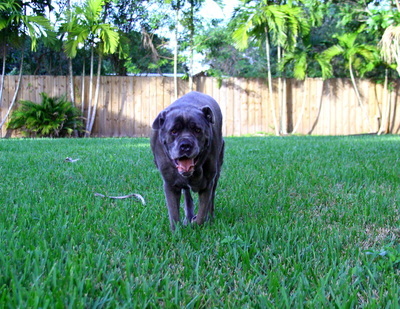 He is friendly with friends who come over but like a typical Corso, he will observe guests before getting too close. If you feel that you can provide Diesel with a good FOREVER home, please fill out our CONTACT US form so that we can send you an application for adoption, conduct a phone interview and possibly a home visit. Below is a slide show with some photos of Diesel.